I've been using XnView for years and I love it. I've tried all the others, and I prefer XnView even to Adobe Bridge. It is very fast and the toolbars are completely configurable. And you can even see illustrator thumbnails and some other vectors. Thumbs up for me. This has made a difference in my productivity. If it is checked, every time you open a folder and XnView builds its cache, it is likely to follow the link in your .URL file. Basically, it opens everything it finds in the folder during the caching process. Even if it isn't caching the .URL file, if you point at it with the option enabled, it possibly attempts to open it. Also, you might want to look in the Browser menu under File List, and make sure that "All Other Files" has nothing checked. I've been using XnView for a long time and its feature set is outstanding; it's an indispensable media viewer and manager. Lately, it has been getting on my nerves and I've been starting to view it as spyware/malware !! If I have a .URL file in the same folder as an image, then XnView will try connecting to the internet. If I remove the .URL file from the folder, then XnView won't do this. I've looked all over the App Preferences and at XnView support forum but I can not find a solution. There must be a setting somewhere that controls this behaviour. I'm at my wits end, and I'm very close to ending my relationship with this software. In my opinion, the developer of XnView has made a BIG mistake not clearly explaining to the user the exact steps to control this behaviour. Some of those URL's XnView is trying to connect to are not even related to the actual path in the .URL file !! Can somebody with an intimate knowledge of the settings please help. Thankyou. I don't think "Dependencies: MSVCR71.DLL MSVCP71.DLL" needs inclusion here anymore as this works out of the box on a virgin Windows 2000 install (which does not include those files). I didn't want to remove it on the off chance that it applies to Windows 9x and someone still cares about that. RE: Andrew Lee: Local, I have just updated the instructions to configure settings so that everything is stored in the EXE folder, so please take a look again. I cannot find the instructions to configure settings. Please give specific instructions to find the instructions. XnView V1.97.8 need it to work on APNG !! XnView v 9.1.7.8 full crashes opening images on 64 bit windows 7 ...working on apng.. that could be the problem? any ideas..tried reinstalling.. HELP! 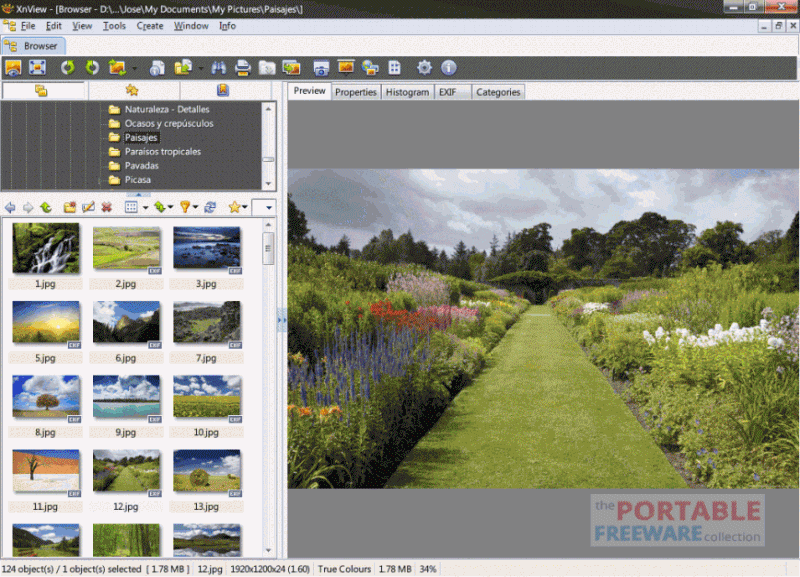 I have tried the popular freeware image viewers -- FastStone Image Viewer (FSIV), IrfanView, and Xnview. Xnveiew is clearly superior for me. I have more than 14,000 digital photos. I use Photoshop for editing and Xnview for browsing and printing. IrfanView makes a thumbnail cache of a directory on the fly, writing to memory and not to disk. At every program launch or directory change, IrfanView recreates the directory thumbnail cache. This is much too time consuming, and makes IrfanView unsuitable for me. FSIV and Xnview save thumbnail caches to disk. FSIV offers 5 thumbnail sizes, none suitable for me. Xnview offers wide user latitude. My Xnview thumbnails are big, beautiful 240 pixels x 240 pixels. My thumbnail cache is consequently a whopping 230 MB. FSIV requires thumbnail cache files reside in the FSIV directory. Conveniently, Xnview permits the location to be user specified. My location is a dedicated directory on my data partition. When I periodically back up my data partition to my external USB disk, the Xnview thumbnail cache is automatically backed up. FSIV does not offer tabbed viewing of multiple open files. Xnview does. FSIV offers minimal editing function. Xnview offers a wide variety, even a decent shadow & highlight correction. FSIV does not support third party Photoshop ".8bf" filters. Xnview does, if the filter is not restricted to Photoshop and if the filter does not require multiple layers. For these and other reasons, Xnview is my choice. FastStone Image Viewer is better than this amateurish-looking app. FastStone's full screen info and edit tools alone make it a far better program. Whatever. Everyone has a favorite. qwert, what are you complaining about, at least it's free. ps your an a-hole. @QWERT: I think that is a lie from irfan skiljan, and so what? XnView is still better! Alternatively, if you don't need to view ECW files, just delete Xecw.dll from the plugins directory. instead of XnView-win-full.zip which is downloaded from this page, and it should work for you too. Just a response to my problem. 1) the program still opens and runs (but the error message repeats when you rerun it. 2) When I coppied my .ini from my old copy, it doesn't produce the error. I just downloaded the newest version, 1.95.3 and was wondering if I was the only one who got an error message saying that NCSEcw.dll doesn't exist. One really nice feature is the ability to create a standalone EXE slideshow for your pictures. It made a beautiful thumbnail viewer of 70-odd MB of pictures in 2M for me. xnview full is 30 megs uncompressed, roughly 20 megs if you delete the language files and you can also upx compress some of the files, i use upx shell (by ion-tek) the end results were just 14.1 MB in size. XnView 1.94.1 is out, by the way if you get the full version you can save space by deleting the language files. optional is deleting media detector and any plugins you will not be using from inside the addons and plugins directory. if you get the full version it includes plug ins that enabled it to read zip, rar and 7zip archive, albeit a little slow, but very cool. highly recommended image viewer. @Fuego: The download link above is the same link as the Zip file "Server 1" link on the official download page. download linked from this site doesn't run well on vista, complains of missing dll i had to re download from official website. Forgot to mention in my prior comment. For photo editing, I use Adobe Photoshop Elements. For photo browsing, I use XnView -- in my experience, the most convenient and efficient photo browser available. When browsing with XnView thru a directory of photos, I use XnView to selectively pass photos to Photoshop Elements for editing. A favorite application becomes even better. Many thanks again to Pierre-emmanuel Gougelet. The "experimental" highlight/shadow tool works well to recover details lost in shadows and/or highlights, much like a "contrast mask" in Photoshop-type programs. I had a problem with the older 1.91.2 where this software was only printing to first printer in the select printer list. It was a bug. Installed this newer version and seems like it's working correctly. XNView is Super Awesome great software! Lovin it. Can someone explain what is this "Photoshop Plugins" stuff, and how/when to use it. I'd like to learn that. I've been using this for a while, very useful.. although it supports over 400 formats, it doesn't support some of the rare/arcane, propriority formats unfortunetly. The software is great, but I could't find a way to add a frame to my pictures, as mentioned in the text. Local, I have just updated the instructions to configure settings so that everything is stored in the EXE folder, so please take a look again. Any one know how to stop this happening? Paz, not sure about the INI problem (works for me), but the prefetch directory is a WinXP trick to speed up app loading and has got nothing to do with portability. Try searching "prefetch" on Google and you'll get tons of links on the subject. I have all options unchecked in the "System Integration" preferences, and "Save as INI in folder XNView" selected, and still XNView folder and files are created in the local "Application Data" folder. Is it normal to also have references to XNView written in my local "WINDOWS\Prefetch" directory? Download the minimal version, it is only 2.88MB and doesn't have any hooks into the registry.